HomeDigital ComicsiPhone & iPad ComicsThe D.E.C. Is Now Available From Uproar Comics! 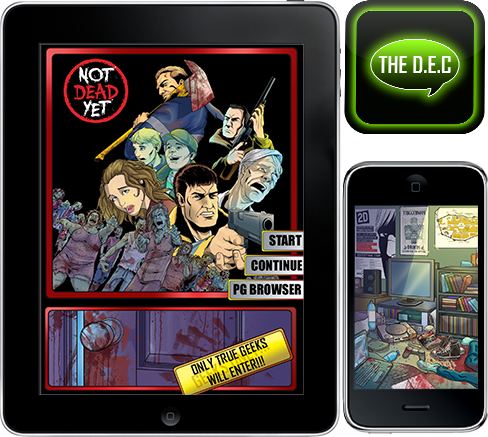 The latest interactive motion comic platform the D.E.C has launched with its first title “Not Dead Yet”. This post acopalytic Zombie installment brings together 2d and 3d animation, audio, unlockable content and more to deliver a better user experience for digital comics. The first 30 page installment of the animated interactive motion comic “Not Dead Yet”by Uproar Comics. Find and collect 8 additional side stories hidden throughout the pages of “Not Dead Yet”, a total 63 pages of extra content! Unlock 5 complete character biographies including individual back stories as the characters are introduced. In App access to some amazing music from the Not Dead Yet universe, featuring Droids and Triggermen. and more to come with each update!! Get it now and check it out on iTunes!